When casting plastic resin (or even plaster), it's good to have a way to measure the material. You don't want to end up using too much or mixing too little. The problem with measuring cups is that they are difficult to clean. Here's a way to make a measuring cup that never gets dirty. 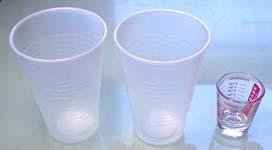 Get 2 clear 16 ounce plastic cups and a liquid measuring cup. The measuring cup shown here is a 1 ounce cup. Nest the 2 plastic cups (set one inside the other). Measure 1 ounce of water in the measuring cup. Pour it into the large plastic cups. Place a mark at the waterline with a fine tipped permanent marker. Place 1 additional ounce of water into the cup. Place another mark at the new waterline. Continue adding 1 ounce of water and making a new mark each time. Once you have about 12 ounces, you'll probably have enough marks on the cup. Remove the cup of water. Place a clean cup inside your measuring cup. Pour the amount of resin you want into the inner cup. I'm pouring 3 ounces into the cup. When you remove the inner cup (with resin), you'll still have a clean measuring cup to use again. In order to make dead trees, we first have to look at some real ones to get an idea what they look like. Real dead trees don't have a lot of branches. That's because their branches are brittle and many have broken off in the wind. Dead trees (at least the spooky ones for a graveyard) have lots of bends and twists to them. 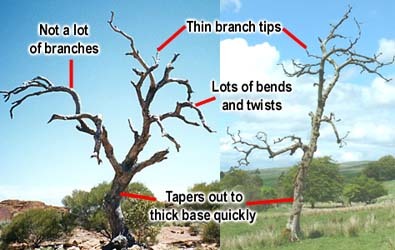 Dead trees also taper quickly from very thick at the bottom, to very thin at the top. 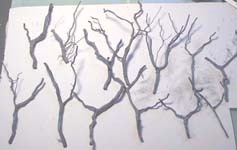 That's why sticks or twigs don't make good trees, because they don't taper as much as real trees do. It occurred to me that roots from small trees or plants would make good trees. Look at the photos above, and imagine a small potted plant turned upside-down so the roots would stick up out of the ground. Couldn't you imagine these trees being roots from small plants? Now the problem is to find roots that will work. Most small trees will work for this. Go to a wooded area (ask permission if it's not your own) and look for some small trees. Usually, trees will drop nuts or seeds around, and little trees will spring up everywhere. Very few of these trees grow into big trees because they have to fight for sunlight and root space. Also, try to find some soft ground, not hard rocky soil. You will be surprised how tough it is to pull up a small tree without breaking it off at the base. Wear gloves if you have them. That will save your hands from getting torn up. Trees are pretty hard to pull out. Grasp the tree firmly at the base and pull it out of the ground. Hopefully, most of the roots will come up with it. The smaller the tree, the better. Try to find one in soft ground. 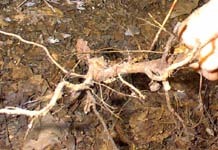 The best place to look for roots is on the side of a creek bed. 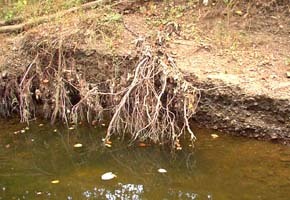 Water erodes away the banks revealing roots. I hit the jackpot with the creek bed. All I had to do was get a big pair of scissors and cut away the roots that looked the best. I would suggest wearing some bug repellant though. A few days later I discovered a couple hundred chigger bites all over me. 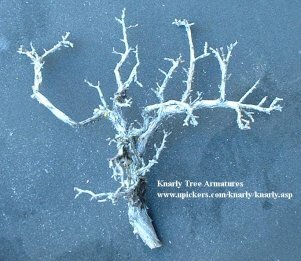 Another source for miniature dead trees is to use sagebrush. 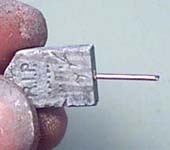 You can find it at Knarly Miniature Modeling Materials. For an 8" tall tree, it can cost from $1.50 to $2.00 per tree depending on how many you order. This photo is from their web site. This tree measures about 5" tall but they have trees as tall as 18" if you need something that large. For those people who have no woods around where they live, this might be a pretty cost effective solution for good looking dead trees. They take a check or money order, but don't accept credit cards yet. Wash off the roots and set them down on a piece of paper to dry. Trim down the roots to the height you need them. Dry-brush a medium gray paint on them. 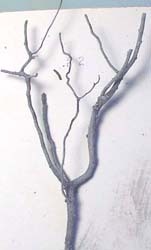 Do this carefully, because some of the roots may be brittle and want to break off. You'll notice that the roots have a lot in common with the dead tree photos, especially that they taper quickly and have a lot of twists and bends. I thought the more twisted and strange looking roots would fit into the graveyard better. To secure the trees to your base (if you're using foam as a base), poke a hole in the foam with a paintbrush handle. Put glue on the end of the root and shove it into the foam. You may want to be careful when handling the piece of terrain made with these roots. They can become brittle and break over time if you're not careful. 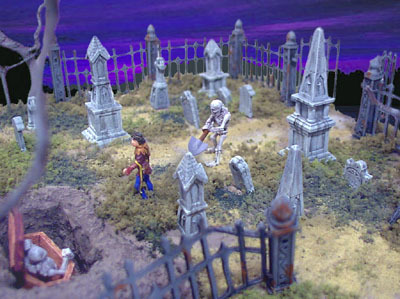 To see how to build the rest of the graveyard, check further down at Building the Gothic Graveyard. For the graveyard that I'm making (see Building the Gothic Graveyard below), I'm going to make an open grave. For this I need to make piles of dug up earth around the grave site. 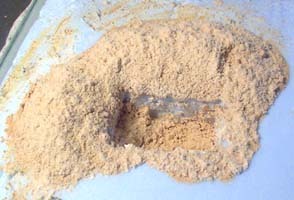 This technique also works great for mine shafts, trenches, and anywhere fresh earth has been recently dig up. Since my graveyard is based on foam, I'll start by cutting a hole in it large enough for my coffin to fit in (about 1" x 2"). Dig out the foam with a screwdriver. Don't worry if the sides are rough, they need to be in order for the hole to look dug out. I dug a little too far, so I glued a piece of cereal box on the bottom of the foam base. Mix up a small batch of plaster. You want to mix it extra thick so you can pile it up a bit. The plaster should be the consistency of whipped cream (only much heavier). 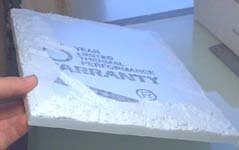 If the plaster is too thin to heap up, you may have to wait a few minutes until it thickens up, or simply add more powder. Spoon the plaster around the outside of the grave site. 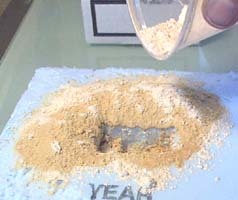 Sprinkle dry plaster over the wet mounds. The dry plaster will soak up the water and leave a dirt texture on the top. To be sure this powder sets up, gently mist the surface with water. Let the plaster dry completely (which may take overnight). Once dry, paint the dirt with a thin dark brown paint. Be sure that it soaks into all of the cracks. The next step is to dry-brush an earth color on the dirt pile (the same color used on the rest of the ground). 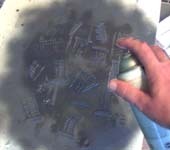 You can further enhance the look by brushing a brown ink wash over the whole pile. You want the dirt pile to be darker than the rest of the ground because freshly dug earth is always dark. 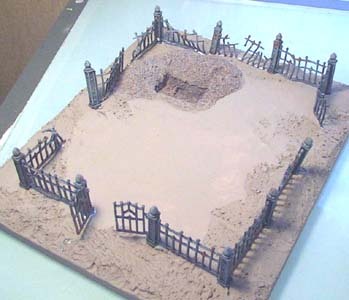 To build this graveyard, you'll need to cast Mold #46 the Gothic Graveyard mold 6 times. 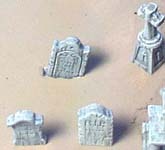 It's not a lot of casts, but you don't need a lot of pieces for this graveyard. 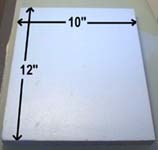 The foam for the base of the graveyard is 1" thick polystyrene insulating board (also known a Dow Blueboard, but it comes in pink as well). This is used to insulate a house before they put on siding. You can find it at most building supply stores or lumber yards. I wanted the ground to hump up in the middle slightly, so I'm trimming it with a bread knife. Here's what the ground looks like after trimming. I didn't cut much away, just enough so that the ground wasn't totally flat. Lay your fence sections around the outside. 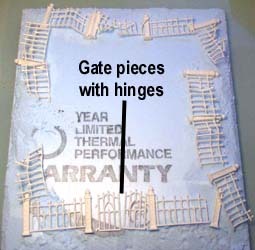 For instructions on bending fence sections, see How to use Mold #46. Don't worry if the fence sections don't line up, or you have a gap between pieces. This is supposed to be a ruined fence. Here are the monument pieces that will be used for the graveyard. Most of the pieces will be glued back-to-back. Arrange and glue these pieces in various ways to make a number of different monuments. Since the 4 headstones can't be combined with other pieces, they'll be used alone. If you don't wash them off, paint will not stick to them. 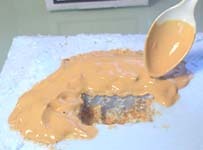 The mold release used when casting the pieces forms an oily coating. If you don't wash the pieces, paint will not stick to them (even spraypaint) and will flake off. I spray painted the fence sections (and posts) with a flat black spray paint. Be sure you work in a well-ventilated area! I suggest doing this outside if possible. Make a section of dug up earth in one corner (see the section above). If you added wire to the fenceposts, glue and poke the sections of fence into the foam. If you weren't able to add wire, just glue them down onto the foam. 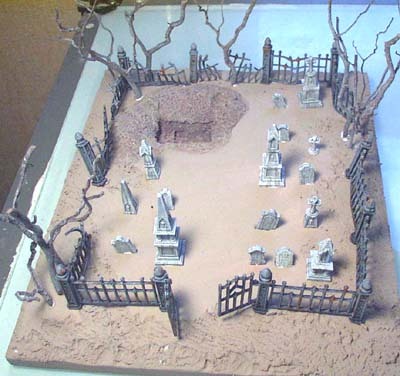 There are a couple of ways to insert the tombstones. First is to poke a hole into the foam with a screwdriver. Then glue the tombstone into the slot (crooked if you like). The disadvantage is that your tombstone will be shorter because part of it is buried into the foam. 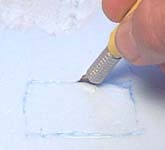 The second method is to add a piece of wire to the bottom of the tombstone. You'll need to drill a very small hole into the bottom to insert and glue the wire (I used a dremmel tool). Poke (and glue) this wire down into the foam. This makes the tombstone very stable and you don't have to sink it down into the foam. I drilled and wired all of the monuments in this graveyard. 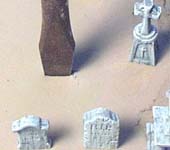 This photo shows the position of the tombstones and monument pieces. The ink wash on them really gives the impression of old stone that has been rained on over the years. From this photo you can also see what combination of monument pieces I used. The cross decorations are glued back-to-back as well. Glue in the dead root trees (see the section above). I put these roots into groups on just a few places around the outside of the graveyard. 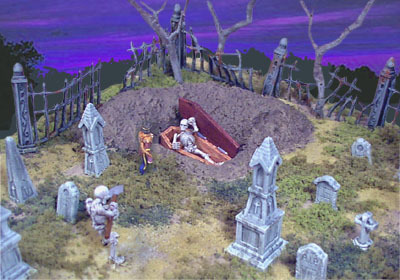 You don't want to put trees all around, because it makes it difficult to reach into the graveyard to move figures. It also makes it difficult to take good photos of the graveyard if there are lots of trees in the way. The last step is to add the ground cover. I'm using Woodland Scenics ground foam for most of it. Thin down some Elmer's white glue with water. Paint it on the surface with an old paintbrush. Sprinkle on the ground foam. 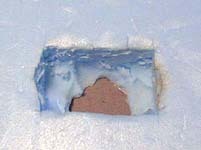 For more realistic ground, vary the color and texture of the ground foam. 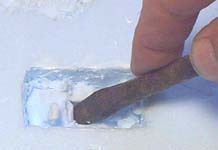 When applying the coarse ground foam, press it into the glue with your finger. 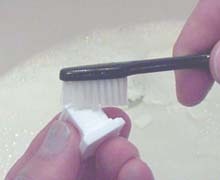 This will help the glue soak up into the foam and hold it in place. 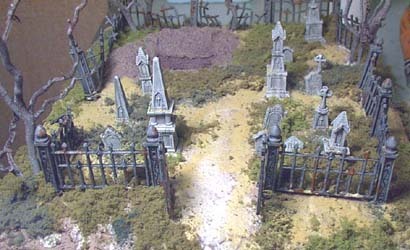 The photo on the right shows the variety of color and texture in the graveyard. If you cast your tombstones and monuments out of plaster (instead of plastic), you can break them off for some realistic looking broken monuments. Sir Robert's Last DiscoveryHere are a few photos of the finished graveyard. For close-up photos of the individual pieces, plus other ways to use mold #46, go to the How to use Mold #46 page. 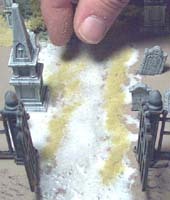 The monument bases can be used as column bases for walls. The crosses and roof peaks can be used to decorate the tops of steeples and buttresses. 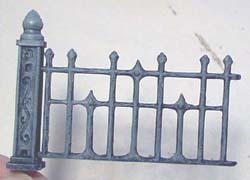 The fence sections can also be used to span archways and put bars into windows. The coffin was spray painted white, then brown paint was wiped on like a stain. 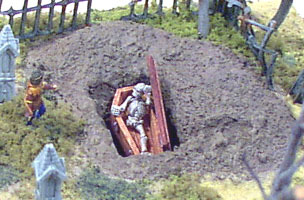 The trim of the coffin was painted a dark brown. Looking back, I should have made the coffin a little more of a gray color. The skeleton models are Warhammer(TM) miniatures from Games Workshop.